Systweak AntiSpyware has a vast database of spyware infections. It can protect your computer from Malware, Trojans, Sniffers, Adware, BHOs, Exploits, Key Loggers, Worms, Monitoring Programs and similar threats. The infection could be low-risk, annoying pop-up adverts. Or your computer could have a high-risk infection that steals your confidential data or secretly reformats your entire system. Systweak AntiSpyware delivers all-round protection that can remove all the infections downloaded to your system. It will even protect you at run-time with the built-in Protection Guards. With years of research and a dedicated team of professionals, we have all the key spyware infections in our database, to protect your computer from all types of infections. Unlike other programs that incorrectly identify important files and registry entries as malware, Systweak AntiSpyware uses the latest technology to ensure that we only delete the bad guys' files. 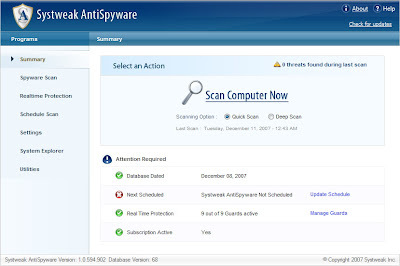 Systweak AntiSpyware is an all-in-one solution. The bad guys can infect your system, hurt system performance, steal confidential data, spy on your system, record your chat conversations and browsing habits, remotely control your computer, and run self-replicating, fast-spreading programs that attack security holes in your computer network. Systweak AntiSpyware protects you from all of these, without using much of your systems resources. WE BETTER DO NOT HOTLINK WHY? change filenames without breaking links, deactivate URLs with one click, and create URLs with expiration dates.... Quickly find which sites are generating ... and which are just generating traffic. run in trial mode, disable subscription and download the database update manual see below! 21 more Spyware signatures found!!! outdated follow instruction at the end! As of December, 10, 2007 Database Version 65 from November, 30 is out of date! Pirated Licenses will be logged include IP numbers on them server. You been warned! Internet makes it possible if you paid anything and want service such as regular updates , you have to agree that your private information will be send and logged to the manufacture back . Up to every 2nd program have functions like this present for anonymous trial user and registered customers while registered have records of your address, a profile can be easy done. A active and passive (NAT) Firewall is recommended for in and outgoing traffic!!! Download, close program (AntiSpyware.exe) and copy database.zip to Program folder, start AntiSpyware.exe!! !